Update 11-07-2018: Sleep Silent appears to have changed their name or merged with SnoreMD. The devices are very similar to each other. You can go directly to the SnoreMD website here. 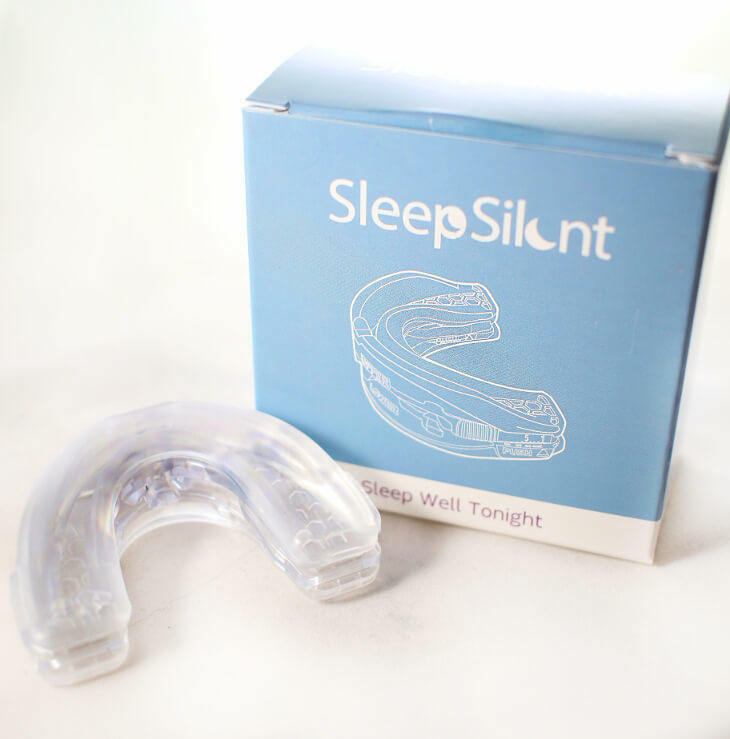 Sleep Silent is a new device released in 2017 that was developed to help patients with bruxism but can also prevent snoring. Available on Amazon, the device is cheaper than other anti-snoring devices with the same features. The product itself is a night guard with a thin profile and non-invasive design that ensures a good and comfortable fit using a custom mold. Sleep Silent is made of non-toxic, medical grade materials that are BPA and latex-free. The device is custom-molded to your teeth in a ‘boil-and-bite’ process that allows it to be used within five minutes. The open-front design allows the user to breathe naturally through their mouth and nose for better circulation. Sleep Silent boasts that over 90% of users experience better sleep when using the device. Much of the design has similarities with SnoreRx. 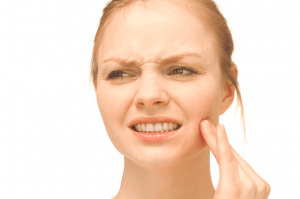 Bruxism is where patients clench, grind or gnash their teeth. This problem can occur while awake (awake bruxism) or while asleep (asleep bruxism). It is considered a sleep-related movement disorder and those who suffer from bruxism are more likely to snore or experience sleep apnea. One of the man causes of snoring is the constriction of airflow. Air has a harder time flowing through which causes the muscles of the throat to vibrate and results in the phenomena known as snoring. Its functions include jaw adjustability that can help reduce snoring, as well as preventing bruxism. By adjusting the jaw, you’re able to increase airflow and reduce snoring. Silent Sleep doubles as a mandibular advancement device (MAD). MADs help hold the jaw in a forward position which helps keep the airway clear. This MAD can prevent the tongue from blocking the airway and prevent the throat muscles from vibrating. The methodology for making the mold is simple. The website boasts that it only takes five minutes to create it, and this was found to be true in my experience. You need two cups, a microwave, and a spoon. I could get a good custom mold on the first try with a minimal headache, which is always rewarding. You start off by heating a cup of water (total of 14 oz.) in the microwave until boiling (I used a thermometer to get it to 200 degrees. This took approximately 2.5 minutes). I then inserted the Sleep Silent device in the boiling water for 90 seconds and removed it with the spoon. The next step is to place the mold in cold water for a few seconds and allow it to cool down (but not too much). Once you are sure the upper tray is facing up and the device isn’t too hot, bite down hard for 30 seconds. For me, the device temperature ranged from warm to hot, but I didn’t find it to be uncomfortable. After the 30 seconds, I removed the device from my mouth and placed it in cold water for another 60 seconds to set the impression. After making the mold, I started to test the device and discovered it had a few great features that other bruxism and snoring devices lack. For one, I could swallow with the device in my mouth. This swallowing has been one of my biggest concerns with other devices. It is almost impossible to adjust to wearing a mouth guard at night when you’re unable to do something as simple as swallowing. With Sleep Silent, however, I could do so without any problems. Furthermore, the jaw adjustability feature of Sleep Silent was a nice bonus. It allows you to adjust the lower tray forward or back to a position that is comfortable for you while sleeping. You can improve airflow and reduce snoring by moving the lower tray forward. Sleep Silent is a comfortable, easy to adjust, mouth guard. I started off wearing the device for 10 minutes at a time for a few days to get used adjust to wearing it. The first night I wore Sleep Silent, I wore it for almost an hour to help get used to it. I was reading a book at the time and didn’t notice the mouthpiece. There is some saliva build up while using the device, but it is easy to swallow. One thing to note, however, is I had dry lips after wearing the device for about an hour. The next night, I wore the device for four hours before bedtime and didn’t wake up all during the night. When I woke up the next morning, the device was still in my mouth and hadn’t bothered me at all. There was no excess saliva, dry lips or anything. I felt completely normal, and it only took two nights to get used to Sleep Silent. Other devices have taken me five days or more to adjust to using. I removed the mouth guard and checked my SnoreLab app to find out I had great results! I spent only 2% of the night snoring which is one of the best results I’ve had with a mouthpiece. Usually, I average around 25-30% of the night snoring, and sometimes more. For me, the 2% of the night I spent snoring didn’t sound like heavy breathing. Instead, it sounded like a light whistle. Taking care of the device is a simple process. It is recommended to brush Sleep Silent with a toothbrush and toothpaste daily and allow it to air dry to eliminate bacteria build-up. Denture solution can also be used once a week or every two weeks. It is reported that Sleep Silent can last anywhere from 7 to 9 months, depending on the severity of bruxism. As I do not have bruxism, I cannot comment on how it works as a treatment. 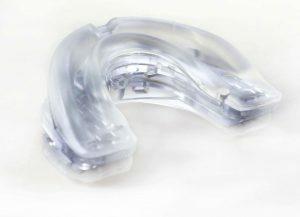 Sleep Silent works just like other mouth guards to help prevent snoring. This product is great, and I recommend it for anyone looking to reduce their snoring habits. You can try the product risk-free for 30 days to see if it’s a good fit for you. If Sleep Silent doesn’t work for you, there are numerous other products available that have proven success in reducing snoring. You can find different mouthpiece reviews to help you determine which product is right for you.